We are a creative, scientifically minded startup located in Albuquerque, New Mexico. Our goal is to provide excellent 3D printing services to everyone while expanding public knowledge of 3D printing and its applications. 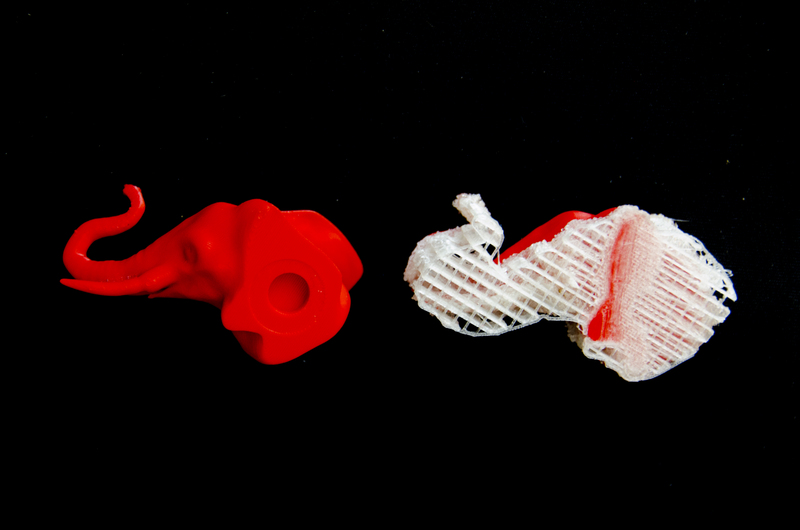 We want to inspire others by allowing them to create objects of beauty and usefulness with our 3D printing. This section will guide you through the website. Learn more about how 3D printing works. 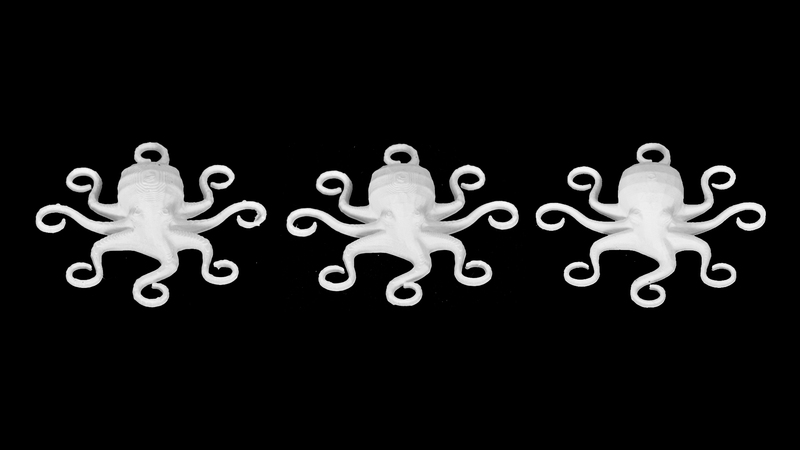 To purchase a 3D printed object, head to the shop. Want to purchase a custom model? 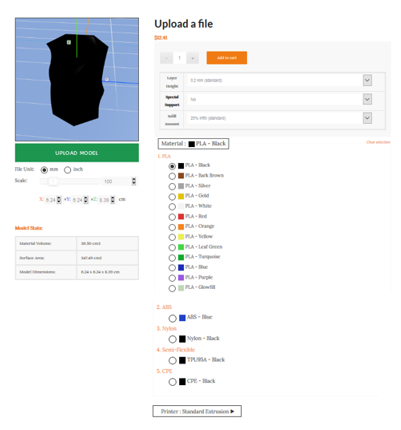 Upload a file to order. Continue reading for tutorials on how to use this website. Click any of the following subjects to learn more. If you aren’t sure what to do, this section will walk you through the process of ordering. First, you can go to the shop and use it like any other internet shop. 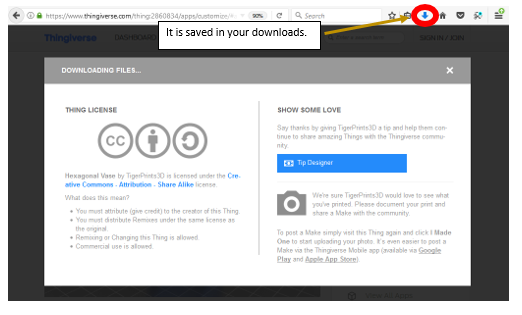 If you want to upload a file, this is how you do it. First, get a .stl file. 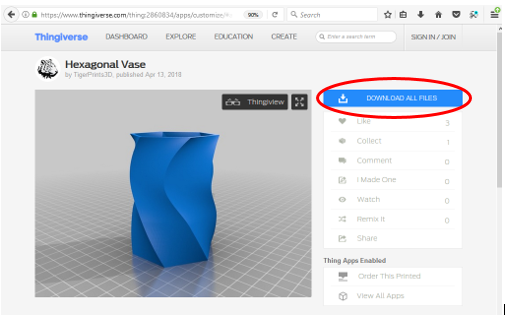 A free to use example is found on thingiverse (Windows is used here, but other systems have similar attributes). Inside are the appropriate files (in this case, only one). Drag and drop to the appropriate location to unzip (desktop is used here for convenience). The file is put onto the desktop. 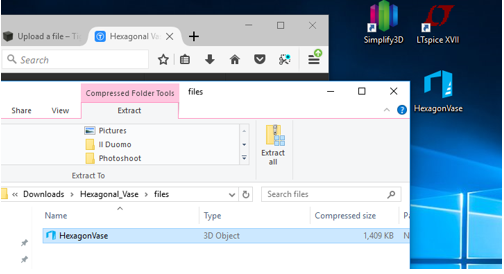 You now have a .stl file that can be used! 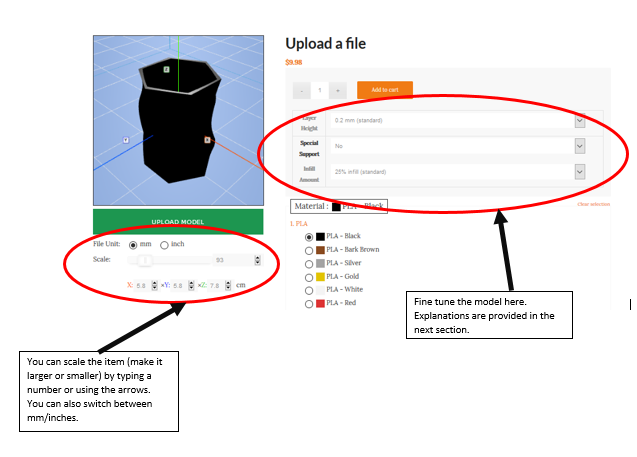 Check out the next section for how to upload and see it on the website. Another is found in the SHOP – click the Upload a File option. The first is to click the upload bar, navigate to the file you want, and double click. 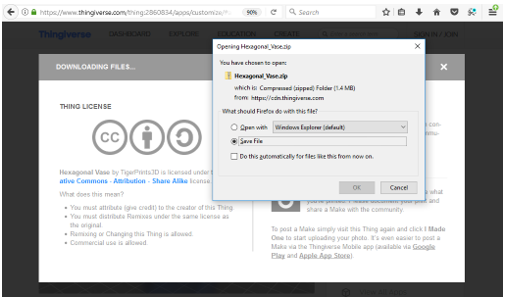 Another option is to drag and drop the file directly onto the empty screen. 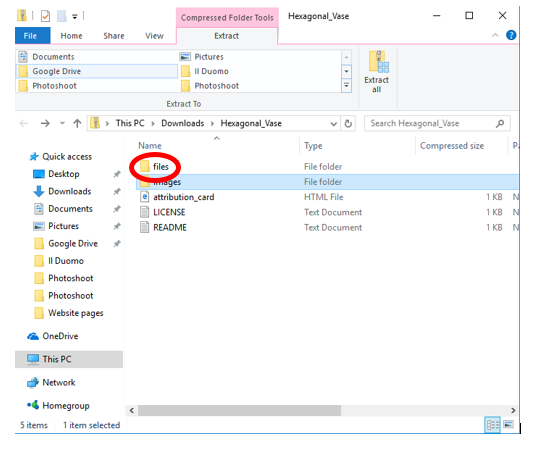 If you drag another file, the new one will be uploaded and the previous will no longer be shown. Make sure you add to cart if you want to keep your changes! 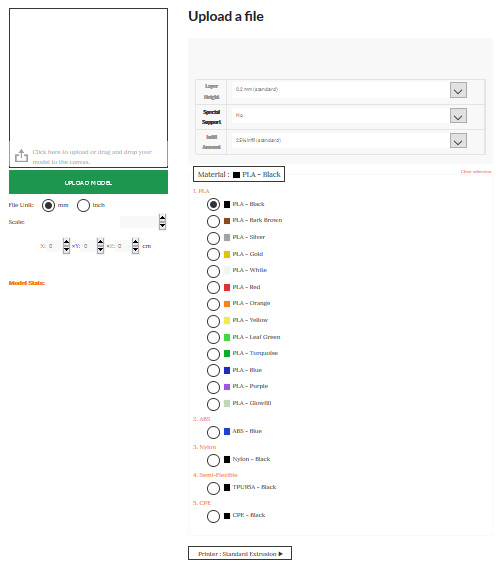 This is where you customize the options, and can change the number of objects to add to cart. Hover your mouse over materials for pictures and more details. Choose the material by clicking on it. 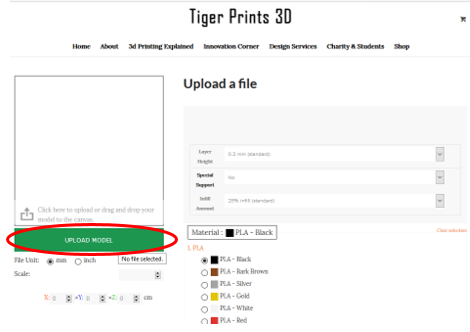 If you want dual prints, upload both files separately, and comment on them during the checkout. They should have the same layer height and infill, and can’t use special support. If you want multiple dual prints of different colors, each set must be uploaded individually. For instance, lets say you want a model with blue/green and blue/red coloring. 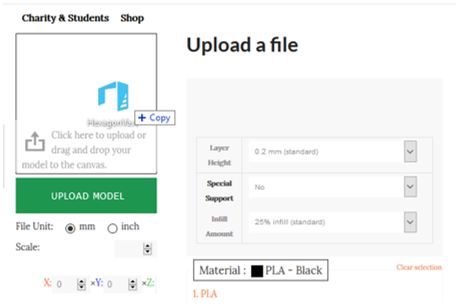 You must upload four models total, each with the same specifications. When you are done, choose the number of models you want and click ADD TO CART. Details about the variations and materials are covered below. Prices for shipping in the United States is based entirely on the cost of the total order. For orders below $10, shipping is $3. For orders between $10 and $50, shipping is $5. For orders over $50, shipping is FREE. The price of an uploaded model is based primarily on the volume (in cubic centimeters or cm3). Further additions change the price by a percentage. Minimum size is 3mm per axis, and minimum cost is $1. 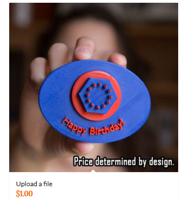 Most 3D printing websites charge $0.40 per cm3 (of PLA), but we start our prices at $0.34 per cm3! The prices get cheaper as the model increases in volume. After $50, or about 147 cm3, the pricing is reduced to $0.28. Over $100, or 325 cm3, the price goes down to a low 02.2 per cm3. Other types of material (such as Nylon, glowfill, PLA or CPE) cost an additional $0.02 per cm3. Variations can increase the cost by a percentage. For example, using advanced supports is 20% extra. Having a layer height of 0.1mm will increase the cost by 15%. If both are chosen, it will increase the final cost by 20%*15% or 38%. 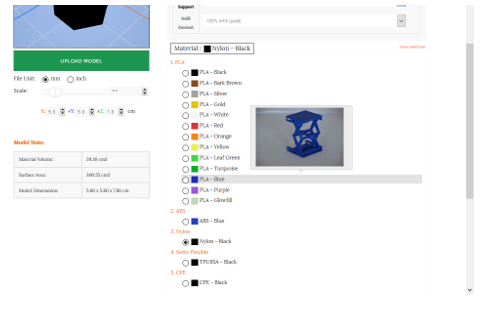 Note, this is still better than other professional 3D printing websites. If you find a site that can do better prices with the same features, let us know and we will try to match it! The object you want printed can be modified in many ways to improve the quality and features you are trying to emphasize. Below, you will see dropdown bars explaining the variations and material properties. Layer height determines the fineness of the print. Thicker layers are coarser, while finer layers are more refined and look better. 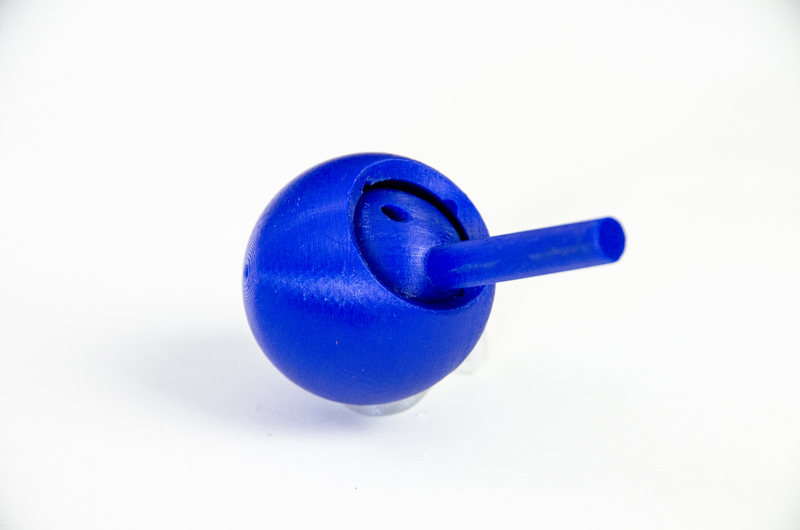 For simple shapes and large models, the standard 0.2mm height is sufficient. If you want to print a model with fine features, or make a small model, then shorter layer heights are recommended. Models that have fine features and models (such as busts, ships, and complex geometric shapes). Example of special support for complex overhangs. Moving part models (such as internal wheels and gears). Ball-and-socket joint can only be printed with special support. Note the holes for easy rinsing. Special support prints may require extra production time. In each case, this should only be used if the model has been designed for easy printing with supports. The amount of plastic that goes into a solid piece. 0% infill makes the model hollow, and should only be used when the model is intended to be small and light. 25% infill is standard. This is fairly strong, but light and does not use many resources. 50% infill is a bit heavier, and slightly stronger. 75% infill is even stronger and more dense. 100% infill is the strongest, but also the most expensive. Higher infill is only recommended for models experiencing plenty of use. These are best used for decorations, prototypes not subject to extreme force, and prints with two colors. Please be aware that all features should be larger than 1mm and anything smaller may not show up or be distorted when printed. PLA is both strong and easy to work with. It is relatively hardy, but good for making more precise models. 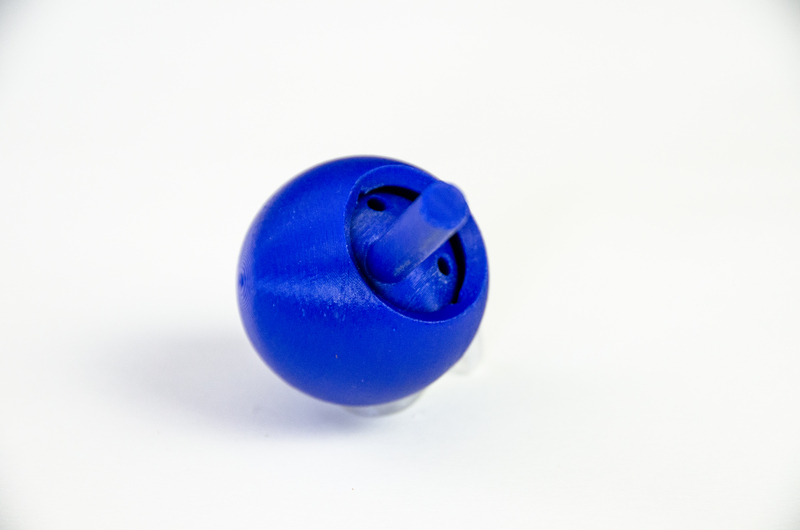 Thin parts and small features can be done with PLA where other materials may warp and be imprecise. ABS is similar to PLA, though more difficult to work with. It makes up for this by being sturdier and having greater resistance to temperature changes. These can be used for objects that have to be tough, durable and survive conditions that would break lesser plastics. Due to their nature, they should not be used for creating models with fine features, and many cannot currently be printed with good support structures. Simple, block-like arrangements are usually best when working with these materials. Nylon is extremely strong, abrasion resistant and difficult to damage. While not indestructible (especially when printed thin), it can serve well for building clamps, containers and gears. 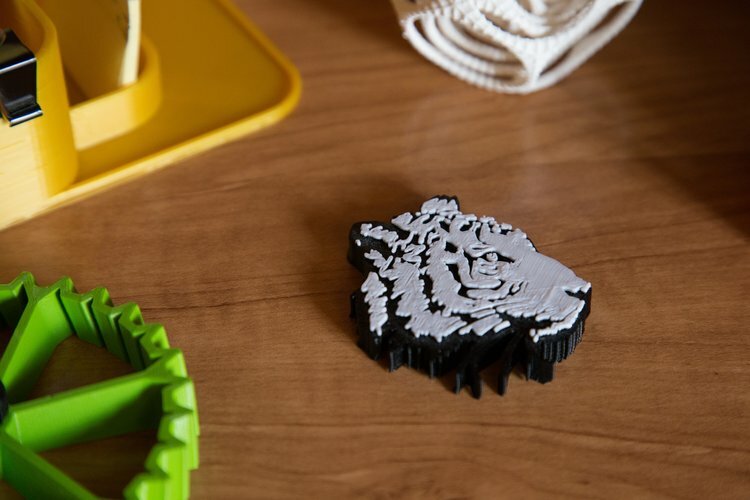 These materials are somewhat flexible (especially when printed thin) and can be used for wheels, washers and other parts where some give is required. They are also quite tough. Tough, resistant to chemicals and weather. Engineering materials should generally not be used for small or complex features. They also should not need support, and should only be built using the 0.2mm layer option. Dual prints should not involve any part using CPE or TIPU. As always, contact us at tigerprints3d@gmail.com if you are uncertain on what to do.